Recently, Midwest Tape posted a blog about the basics of SmartBrowsing. Here, we present a more in-depth look at the advanced search engine, detailing a variety of ways to organize your results for a quick and efficient find. 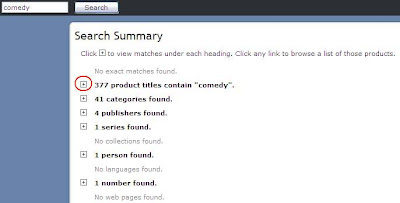 Once a user enters keywords, SmartBrowse categorizes the results in an expandable list that divides products by titles exactly matching or containing the search word, categories, series, collections, publisher names, people, and numbers. The list of expandable subcategories makes it easy to find exactly what you are looking for and ignore what you’re not. Additionally, selecting the expand/collapse (+/–) box will expand or collapse your search results so that you see only the results you want. Also, if there are more than 100 listings for a category you can opt to only view the top 100 bestselling titles or the 100 most recent titles. By doing this, you are able to quickly find the newest and most popular titles. After making your selection, you can arrange information alphabetically or numerically in ascending or descending order by clicking on the column names. For example, clicking on price will sort the titles by the least expensive to the most expensive. Clicking again will reorganize the information so that the most expensive products list first. Similarly, this action works for stock number, title media, misc, genre, release date, sales rank, and price. Another way to manage your SmartBrowse search is to further narrow your results. By clicking on the filter criteria box, you are able to restrict your findings by release date, format, and ratings. To continue perusing through the subcategories in the search summary list, simply select the Return to Original Search button. It is essential to select this button because clicking the browser’s back button will return you to the Midwest Tape homepage, thus closing your current results. Want to learn more about SmartBrowsing? Watch our tutorial. Have you used SmartBrowse? How has it aided your acquisitions experience? 3D: the Future of Entertainment?